DUDES & DUDETTES, THOU SHALT NOT STEAL OTHER ARTIST NAMES, WORKS & DESIGNS (PERIOD). Creative SLOTHFULNESS WILL NOT BE TOLERATED. ​You will be EXPOSED IF YOUR CAUGHT JUST LIKE THAT GUY IN THE MOVIE "BIG EYES" to name a OnE of MANY. ​The Internet will never forget it. DON'T TARNISH YOUR LEGACY (Period). Picasso once said, "Good artists copy, Great artists steal". Well I am here to tell you, HE GOT IT ALL WRONG!!! Here is an important reminder about Intellectual Property. Bruce Lee would be proud. 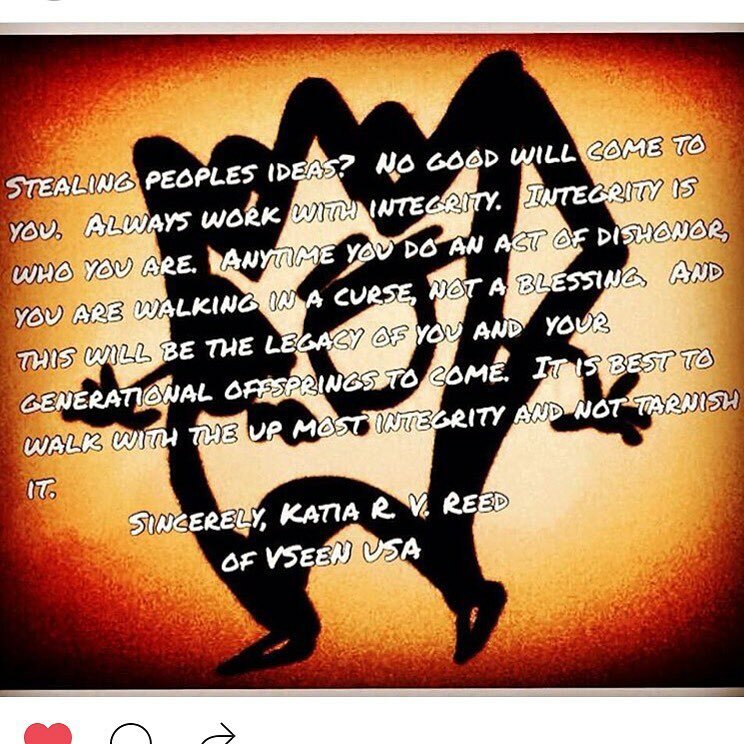 A word from me Katia-Ricciarelli V. Reed creator of VSeeN. Thou shalt not steal other artist names, works and designs.